What, or who, is silencing the residents? 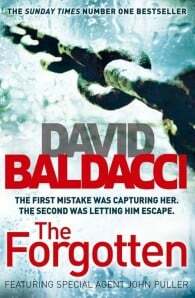 Military criminal investigator John Puller is drawn closer to home when his aunt is found dead in her house in Paradise, Florida. The local police have ruled the death as an accident, but Puller finds evidence to suggest that she may well have been murdered. On the surface the town lives up to its name, but as Puller digs deeper he realises that this town and its inhabitants are more akin to Hell than Paradise. His belief is confirmed as evidence of strange and inexplicable events come to light. And when Puller learns the truth about what is happening in this once sleepy town, he knows that his discoveries will impact far wider than Paradise. David Baldacci is the internationally-acclaimed author of 20 bestselling novels. With his books published in at least 45 different languages, and with over 100 million copies in print, he is one of the world's favourite storytellers. His family foundation, the Wish You Well Foundation, a non-profit organisation, works to eliminate illiteracy across America. He lives in Virginia with his wife and two children.